Hey, guys, I know you've wondered sometime who would win in a fight between two famous monsters. Or between two superheroes. Or between two killer animals. All boys think about this sometimes. Boys have always wondered about this. That's why we had the movie King Kong vs Godzilla back in my day. That's why we had Batman vs Superman this year. 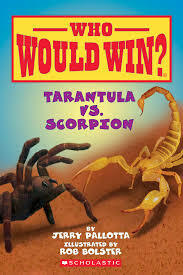 And that's why we have the Who Would Win series of books by Jerry Pallotta (illustrated by Rob Bolster). These books are very cool! 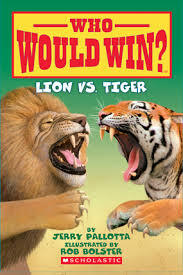 They're informational and interesting, plus they end with a fight between two killer animals. What could be better? 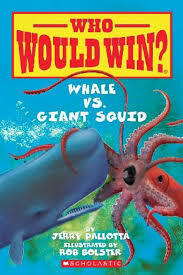 And, if you don't agree with the outcome of the fight, there's a page at the end of each book that lists the advantages of each animal and let's YOU decide who would win! Some chefs use squid ink to make black pasta! 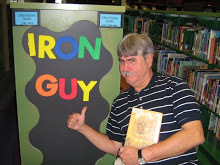 All of these are quick and fun (what I call Good Quick Reads) and would be really good for our younger reader guys, like maybe second--fourth graders, But older guys would enjoy them too. And, teachers, these would be the ideal books if you have boys think they don't like reading. The books you see on this page are only four of the books in this series. There are several others, including Hammerhead vs Bull Shark, Polar Bear vs Grizzly Bear, Komodo Dragon vs King Cobra and (maybe the best one) Tyrannosaurus Rex vs Velociraptor! Our library system has plenty of copies, so go grab some and enjoy! The Boys in the Boat--You GOTTA Read This! I was going to write an intro about how I've been too busy lately to review anything or about school starting back but I'm going to skip all that because I've just finished a really terrific book and can't wait any longer to tell you about it. It's The Boys in the Boat: The True Story of an American Team's Epic Journey to Win Gold at the 1936 Olympics by Daniel James Brown. What a great read!! What a great story!! And it's all true. The book centers around Joe Rantz, a boy growing up in the Seattle/Sequim area of Washington state in the 1920's. His family life was happy but tragedy struck over and over. He got very sick and couldn't leave his room for a long time. Then he lost his mom. His dad remarried after a while and things seemed to settle back to normal. Then the Great Depression hit. Times became very hard and his family left him because they couldn't afford to keep him. He was alone at 15. To survive, he foraged in the woods and did what work he could, including cutting trees. Of course, he didn't want to keep living like this and scraped together enough money over the years to pay for his first year at the University of Washington. If he could get on the university's rowing team, he could get a job to pay for his living expenses. All those years of cutting trees had given him the upper body strength needed for rowing and he made the team. The work was hard. Rowing may look easy but it takes unbelievable amounts of of concentration and stamina. But the coach saw something special in Joe and his team mates--so special that he believed they could be in the 1936 Olympics. And they did. But, on the day of the race, everything that could have gone wrong did go wrong. The team was in dead last place. With Hitler watching. Could they even finish the race? Could they still win? I won't tell you the answer but I will tell you this--you will hold your breath, grip your chair---and then you just won't believe what happens!! Boys, I can't begin to say how great this book is. There are just too many good things to say about it. The only way you'll find out is to go and check it out for yourselves. But you will be SO glad you did! This is one of those rare and wonderful stories that will stay with you the rest of your lives. Go find it! The library has plenty of copies. You gotta read this book. YOU GOTTA READ THIS BOOK! Did I say it enough? You gotta what? Read this book!! PS--this is kid-friendly version of a grownup book. The publishers condensed the original version from 404 to 220 pages and added some photos and cool information in the back so that younger readers could enjoy the story and not get bogged down in slower passages. It's a good idea; there was a kid-friendly version of a book about Stubby the War Dog a couple of years ago. (check out my review here) I read both the grownup and younger versions and actually liked the kid-friendly version better!